Emirates First Class is rite of passage for any aficionado of miles and points. I was absolutely giddy with anticipation for my flight. But were my expectations too high? Check-in was easy at LAX and the the agent did not even bat an eye when she asked me where I was heading and I said Frankfurt. 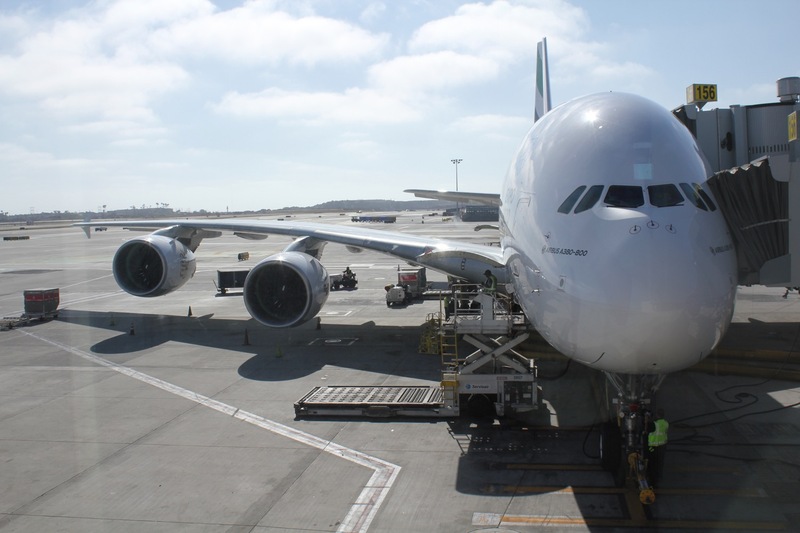 Flying from LA to Frankfurt via Dubai may be out of the way, but it seems many do it. After spending about 90 minutes in the Emirates lounge, I headed to the gate for boarding, sighting the A380-800 that would transport me to fly. It was finally time! Please note this flight took place in 2015. I outline in detail my reason for writing about an “old” flight here, but if you question whether this is still relevant, see Lucky’s recent report…very little has changed. First Class on Emirates is located in the front of the upper deck. A smiling FA welcomed me onboard and upon inspecting my boarding pass, led me through the galley and left to my seat. The cabin is fairly large for first class, featuring 14 seats arranged in 1-2-1 layout. There are four rows of window seats and there rows of center sections, which are ideal for couples traveling together but still acceptable if traveling solo. There are no overhead bins in first class, but plenty of room inside the suite for larger carry-on bags. Seat controls are available both via touch screen and buttons on the seat itself. The lamp is also controlled by touchscreen. Note the “bling” in the suite. While I don’t think my house would look good with so much gold, I love the Emirates design. The suite also featured a beautiful orchid (giving Lufthansa’s rose a run for the money), a large screen, and a personal minibar with water and soft drinks. The suite also featured two compartments below the screen, one containing skincare products and the other writing material. A power plug was located just below the right armrest. After the first meal service, a FA prepared my bed so I could sleep. Bedding is superb and with personal air nozzles, my suite stayed cool and I slept quite well for more than eight hours. I want to be fair here and concede that I may just be the victim of expectations that were too high. Service was good, but it wasn’t great. The purser said hello to every first class passenger before the flight, but I did not see her for the rest of the flight. The FAs working in first class were nice, but I could not believe how long it took to serve meals. I suppose that if everyone is ordering something different at the same time, it must be a zoo in the galley for the FAs, but somehow Qatar manages to promptly serves meals while offering dining on demand to the entire business class cabin. I guess what disappointed me most was that after breakfast (with over an hour still left before landing), I asked for one more cappuccino and was met with a fairly pronounced sigh. That was uncalled for, especially considering I slept through most of the flight. But who knows, maybe I just misinterpreted the situation. The ladies seemed very-well intentioned overall. I’ve received better service on Lufthansa, Etihad, Garuda, JAL, ANA, Thai and Asiana though. One other oddity. The purser welcomed me “back to Emirates” when performing her pre-flight greetings. She did not offer the same greeting to the man across from me or in front of me. Technically, this was my second flight on Emirates…but is the Emirates systems that clever to have a detailed dossier on me? My Alaska Airlines number was part of the reservation, not my Emirates Skywards number. After boarding, I was offered Arabic coffee, a date, and a hot towel. The full bar was open, but I just had a glass of sparkling water before takeoff. Note the snack basket as well, featuring sweet and savory treats. This was collected before takeoff then returned after takeoff. After takeoff, I enjoyed a glass of Dom Pérignon 2004 with mixed nuts. I started dinner with a caviar course and all the accompaniments. Next, Arabic mezze, which just tasted off. You can see this is an elaborate appetizer, but only the tabouleh and stuffed grape leave tasted good. The other items were mediocre at best and the bread was stale. I followed that course by chicken and mushroom soup, which was also just okay. For my main course, I ordered falafel-cursted sea bass filet. The fish itself was tasty, but the saffron creme sauce really detracted from the overall taste. Finally, I had a “wild berry and and vanilla with cinnamon crisp” for dessert along with a cappuccino. Dessert was excellent and I love the stenciled Emirates logo on top of the cappuccino. After a nice rest, it was time for breakfast. Since the plane lands in the evening in Dubai, you have the choice to eat whatever you want before landing. I was in the mood for breakfast and stated with a cappuccino, fresh orange juice, and a green “health” drink. Next, I ordered an English breakfast featuring scrambled eggs, mushrooms, tomatoes, beans and potatoes (no bacon, as all food on Emirates is halal). The eggs were not hot, only lukewarm. Even so, they tasted like they had been freshly prepared. The a la carte menu on Emirates is an excellent concept and I was pleased at the variety and quality of the food. I just wish I had enjoyed the taste a bit more of the dinner and the eggs had been warmer. The novelty of the flight for me was the onboard shower, which I enjoyed very much. One the one hand, it is unnecessary, even on a 15-hour flight. But on the other hand, I found the shower was refreshing after sleeping for eight hours. The first class lavatory is large and well-lit and includes heated floors, which I love. The shower is controlled by timer. Each passengers is given five minutes, but you can pause the timer (and the water) while taking a shower. The temperature was warm, pressure sufficient, and towels plush. The area outside the shower at the top of the forward staircase is transformed into a spa-like ambiance about halfway through the flight, once most passengers have gone to bed. Here, I’ll note that the pajamas and amenity kit have changed from my trip. Pajamas are now “hydrating” and darker in color while the current amenity kit is pictured below. The amenity kit contains more contents than many airlines in first class, including a nice razor and shaving cream, socks, eyeshades, toothbrush, comb, tissues, glasses case, and Bulgari toiletries. Three years later, I still wear these pajamas, by the way. They remain my favorite airline pajamas. Wi-Fi was available onboard, but did not work. In fact, I could not even use iMessage or check e-mail on my phone. Perhaps it worked during the majority of the flight I slept, but it certainly did not work after takeoff or before landing. Emirates’ “ICE” in-flight-entertainment system is unparalleled, except perhaps by KrisWorld on Singapore Airlines. My large screen featured a huge collection of movies, TV shows, games, and music. The library was truly exceptional. I also enjoyed the tailcam on the A380. I forgot about the bar onboard. Seriously. I remembered once I stepped off the plane in Dubai…wait a second, I missed the bar! So that made me feel foolish, but my next installment, from Dubai to Frankfurt, will feature a detailed bar review. I will add that first class passengers have a private bar outside the first class restrooms that features a generous assortment of self-serve drinks and snacks. We landed at dusk in Dubai. What a pleasure it was to finally fly on Emirates. I enjoyed a very comfortable flight overall and slept soundly for eight hours. While the food was not great and the service was spectacular, I still highly recommend Emirates as an excellent first class product. I have a question haven’t you already done this ? I mean how many more “reviews” on EK first class can be done? what we haven’t seen to my knowledge is the new suites on the 777 now that could be interesting. As a reference I have done 6 trips on EK all FC some paid some points enjoyed all of them. I hope to do the new 777 soon, but since I already took this trip and have never published an Emirates report before, I wanted to publish this one. This review is also a remarkable testament to Emirates’ consistency. As a premium traveler (First/Business), was there expedited security in LAX after check-in or are all travelers (First/Business/Economy) lumped together? Do you want to do a review of the Private Suite at LAX? I have a complimentary membership through my useless Jetsmarter membership and I can do first time experience for $750. I’ll split the $750 with you. Even at $375 I think it’s stupid, but I’ll do an LAX-HKG flight or LAX to CDG flight from there. I’ll be doing a test soon enough — United has invited me to test it on their dime. That’s a much better deal. I’m thinking if I get my whole family (4 people) to connect in LAX, then maybe I can justify it. Dessert is spelled with two “s.” Or maybe that was a play on going to the arid land of Dubai. Is that the wording you meant to write about the service? One thing Emirates F does consistently well is the cheese, by far the best in the sky IMO. Someone takes great care in the selection and it’s never the ‘safe’ and bland stuff served up by most of them. I’m not a great fan of the blingy cabin and tacky wood veneer, but the food is generally pretty good ( although I never take the caviar; too pretentious for words. Canned sardines on toast has great culinary merit and appeal). Loved reading this, even if the flight was taken a few years back. Could also note the different shower toiletries. And do you know why that kit is offered on some flights and a smaller one, still with all good stuff, on other flights? Just took DXB-CDG yesterday and had the single best FA of any flight ever. It was excellent.